Previously, if you wanted the iPhone to tell you how to get somewhere—Sesame Street, for example—you had to rely on the phone’s built-in Google Maps support. 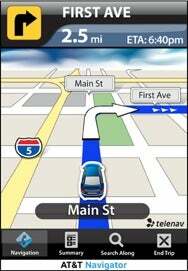 Direction-wise, that's a fine solution—and free—but it's not always the most conducive method if, say, you’re driving. iPhone 3.0 unlocked the ability for third parties to develop turn-by-turn navigation apps that mimic the features you get from car-based navigation systems and GPS devices. While GPS-maker Tom Tom showed off its own turn-by-turn app at Apple’s WWDC keynote earlier this month, AT&T has beaten it to the punch by releasing AT&T Navigator (iTunes link). The application, which provides voice-guided directions with automatic rerouting and real-time traffic updates, is a free download from the AT&T store and includes maps for the U.S. as well as regular updates. Naturally, it requires iPhone OS 3.0 or later, but it’s compatible with both the iPhone and iPod touch. Sounds all well and good, but there is a catch. Though the application is a free download, the service costs $10 per month. On its own, this is isn’t really outrageous: most GPS devices require either a regular fee or a charge for additional maps. AT&T offers the Navigator service for its other handsets for $10 per month (in addition to data charges, which iPhone users presumably escape with their unlimited data plans). However, it does fly in the face of one point made by Apple at both March’s iPhone 3.0 special event and at the WWDC keynote, that “free apps remain free.” In particular, the comment was aimed at the new In-App Purchase feature which allows developers to charge for subscriptions or additional features—pursuant to App Store rules, though, they can’t distribute free apps and then charge for additional content. AT&T can technologically sidestep this problem because it adds the $10 monthly fee directly to your bill—and to be fair, it stipulates the charge in the app’s own name. That introduces another catch, too: you can delete the application from your phone, but until you call up AT&T and cancel the service, you'll still get charged that monthly fee. Is this more egregious than making you shell out 99 cents for the application and then charging $10 per month for the actual functionality? Not necessarily, but it would be nice to maintain the consistency that Apple touted. Then again, when it comes to consistency, the App Store is hardly a shining exemplar of the concept.